Hay fever is an allergic response to pollen that affects the mucous membranes of the nose, eyes and air passages. It is a seasonal allergy. It is caused by the pollen of various grasses and plants. Most cases of hay fever occur in the spring and summer when the antigen is grass pollen. 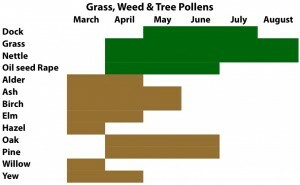 Timothy grass and rye grass cause most problems in the summer and tree pollens peak in the spring. The pollen is airborne and can be blown over long distances in the breeze. Many of the symptoms of hay fever are similar to those of the common cold. Colds are often associated with mild fever and are usually gone within a week. While hay fever sufferers often have a feeling of being ‘wiped out’ for weeks on end. Some people show the classic symptoms of itching, sneezing, a streaming or blocked nose and itchy, red, watery eyes. Pollen is recognised as a foreign body – an antigen. Like an infectious molecule – such as a virus – it stimulates the immune system to generate antibodies. Because of the action of these antibodies, the mucous membranes in the nose and surrounding areas release histamine and other substances, which are normally produced in response to infection. The role of histamine is to dilate local blood vessels, making them more permeable, and thereby helping components of the immune system to get to work clearing up any irritation. Conventional treatments is antihistamine tablets and nasal sprays, which give some temporary relief. But may cause side-effects of drowsiness and affect coordination. In severe cases steroid preparations are prescribed. These can depress more important immune function. And tend to deepen the imbalance in the natural defence system. Homeopathic remedies can be used alongside or instead of conventional medicines. Your doctor or pharmacist’s recommended treatment may be greatly enhanced by the addition of a homeopathic remedy. My Hay Fever Program is probably the best homeopathic treatment available! I have people come back for year after year. Remedies are easy to administer usually in the form of powders, granules, tablets or pills. They have a neutral or sweetish taste, which makes them easy to take especially by children. In acute conditions the response to a homeopathic remedy can be astonishingly quick. In chronic (longer lasting) conditions cure may take longer. Since there may be some bodily changes and weakness. These would need to be dealt with by a qualified homeopath. I recommend starting to treat before the hay fever season starts. In order to strengthen the patient’s constitution and reduce their sensitivity to pollens. A further advantage of homeopathic treatments is that no side effects occur. On some occasions it is possible that a patient’s symptoms may worsen for a short while as the body rebalances itself. In addition to being safe and easy to give, free of side effects and often quick acting in acute illness, homeopathic remedies are inexpensive. An average course of treatment costs little in comparison with some modern drug regimes. For more information about Hay Fever download the leaflet on Homeopathy & Hay Fever – or go to the Downloads section for other leaflets.